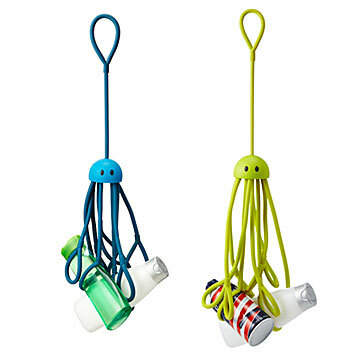 These cute, clever squids are equipped with nine grippy tentacles for holding your shower essentials. Go 20,000 leagues under the shower with this friendly squid, equipped with nine, adjustable tentacles for gripping your shampoo, soap and washing extras, without disappearing into the bathroom void! Wildly convenient, this functional creature even holds your bottles upside down, so you conquer every last drop. Made in China out of natural latex. Available in red, black, blue, or lime green; sold separately. Despite his extracurriculars, multi-talented maker Jens Widerberg keeps it simple when it comes to design, drawing heavily from classic Scandinavian minimalism. The Swedish-born designer has a long and ecclectic resume: ranked as Sweden's number two slalom champion in his youth, he later moved south to become a windsurfer. He became Sweden's fastest kite surfer and the tenth fastest worldwide. Never one to rest on his laurels, Jens also funnels his energy (or whatever's left of it) into creating functional items for the home. Wipe down gently with soap and water to clean. Designed to hold a soap case with the bar soap inside, not the soap alone. Each arm is actually the half of one long tube that has a loop in the end. The 9th arm is the other half of the arm that goes up through the head and becomes the attachment loop (for easy hanging). Recommended for indoor use only. Click here to see Shower Squid instructions. Much cuter than those metal shower shelves, so I bought this to treat myself. Adjusting the loops isn't a problem - how to do it is explained clearly on the product page (I can't believe how many reviewers missed that somehow). My problem with the item is that after a couple of years the rubber starts to crack, as rubber does, so I don't imagine it will be much longer before the arms break off and adjusting the loops will be moot. I guess at that point I will end up with a metal shower shelf after all, as the shower squid is too expensive to keep buying over and over. Not only keeps the bottles from falling, but allows both hands to squeeze the product out. Great for any age. Great gift. This is fun, and practical. Which is a tough combo to find! Thought these would make a good gift for university students who share a bathroom with multiple other people. I expected the tentacles to hold travel sized products and would be easy to transport from a bedroom to the bathroom or would be easy to take on athletic road trips (easy to throw in a bathroom bag for post game showers) but in effect they hold regular sized products, so the product is much bigger than I expected. I don't think they will be much use for the purpose I bought them for (easy transport) but will be fun and useful if used in the home bathroom. They are quite pricey. Clears the tub edge clutter of tipsy bottles, let's you use ALL the product in bottles. Holds a lot of bottles (great for shower used by more than 1 person), it's clever and fun! Buying another one for myself. Great idea to decrease spills and crushed toes! Its small enough so it doesn't take much room in the shower stall. But it is big enough and durable enough to hold multiple items. Just what I was looking for. Perfect for a nautical themed shower!